Lockout is a practice used to prevent the release of hazardous energy. For example, a safety padlock can be placed on an energy isolating device that is placed in the OFF or Closed position. The term Lockout refers to the principle of correctly shutting down an energy source, draining excess energy that may be present and applying devices to that energy source in order to prevent it from being energised. All workers performing servicing and/or maintenace on equipment and who are exposed to the unexpected energization, start-up or release of hazardous energy. 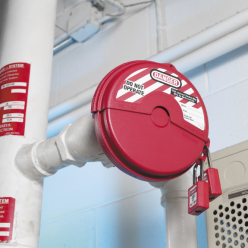 A lockout device stops equipment from being switched on when it is absolutely crucial that it remains switched off. Anything that is an energy source is suitable for lockout, as long as that energy source moves machinery and the components within that machinery.